Having high quality music and video in every room of your house with a single touch of a button. At Audio Addicts we can integrate whole multi-room audio system throughout your home, meaning audio-visual entertainment no longer needs to be restricted to one room. Audio Addicts sophisticated multi-room system permits different music and video sources to be played simultaneously throughout the house. With a multi-room audio system you can choose to relax in the bath listening to easy listening and your other half listens to Rock in the living room. As well as being convenient and efficient, multi-room audio systems help keep clutter to a minimum. 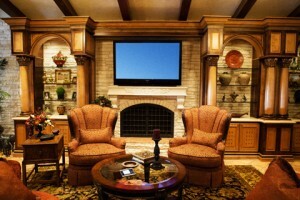 Concealed wiring and discreet in-ceiling and in-wall speaker systems leave no unsightly audio-visual equipment on view. And all this without compromising sound and visual quality. Audio Addicts make your system incredibly intuitive and easy to use with a fully customized user interface. Use wall-mounted keypads, remote control, touch panels or even your smart phone enables you to alter the volume, change radio stations, or browse Pandora, iHeart Radio, TuneIn Radio, Spotify and many more. or control a media server from anywhere in your home. “Multi-room audio” systems bring new levels of convenience, control and quality to your audio-visual enjoyment.